This article is about the motion picture of a fictional story of a character whose name is a homonym of a famous American automobile. For the article on the automobile, see Ford Fairlane (Americas). The Adventures of Ford Fairlane is a 1990 American action comedy mystery film directed by Renny Harlin and written by David Arnott, James Cappe, and Daniel Waters based on a story by Arnott and Cappe. 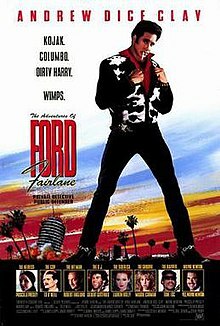 The film stars comedian Andrew Dice Clay as the title character, Ford Fairlane, a "Rock n' Roll Detective", whose beat is the music industry in Los Angeles. True to his name, Ford drives a 1957 Ford Fairlane 500 Skyliner in the film. The film's main character was created by writer Rex Weiner in a series of stories that were published as weekly serials in 1979–80 by the New York Rocker and the LA Weekly. The stories were published as a book by Rare Bird Books in July 2018. The film was both a commercial and critical failure, just barely breaking even with its budget and being awarded the Golden Raspberry Award for Worst Picture, tying with Bo Derek's Ghosts Can't Do It. However, it has since developed a cult following. After the lead singer of The Black Plague is murdered onstage, shock-jock Johnny Crunch (Gilbert Gottfried), an old friend who came west with Fairlane, hires Ford to track down a mysterious teenage groupie named Zuzu Petals, who may have a connection to Black's death. Soon after hiring Fairlane, Crunch is electrocuted on the air. The world's hippest detective soon finds himself trading insults with ruthless record executive Julian Grendel (Wayne Newton), a clueless cop and former disco star, Lt. Amos (Ed O'Neill), a merciless hit man named Smiley (Robert Englund) and countless ex-girlfriends out for his blood. Aiding and abetting Fairlane is loyal assistant Jazz (Lauren Holly) and a hip record producer (Morris Day) at the head of a bizarre lineup of suspects, victims, beautiful women, and a koala as he finds himself hip-deep in the case of his life. The Macguffin of the film is three data CDs which, when read simultaneously, detail the illegal dealings of Julian Grendel, who was getting rich from bootlegging his record company's music and murdered Bobby Black when he found out Black had acquired the CDs with the incriminating evidence. Both of Fairlane's beloved possessions, his house, and his car, are blown to bits, courtesy of Grendel. The first disc was with Colleen Sutton, the second with Zuzu Petals, and the third disc was hidden under the star for Art Mooney on the Hollywood Walk of Fame. It is later revealed that Grendel killed Bobby Black and Johnny Crunch, as he considered them both greedy and stupid because they wanted more money for their involvement in pirating CD's to sell to the highest bidder, making the music industry corrupt. However, Fairlane kills Grendel by setting him on fire with a flammable alcoholic milkshake. Jazz leaves Fairlane, knowing how ungrateful he is for everything that has happened. Smiley shows up and plans to kill Ford, but not before revealing that he killed his young neighbor's [the Kid's] father. Ford distracts him and kills Smiley with a sleeve pistol. Jazz and Ford decide to reconcile, while the Kid decides to join their detective agency. Ford wins a million dollar radio contest and buys a yacht. He sails away with Jazz, the Kid and the koala bear. They're all now one big happy family. "Funky Attitude" — Sheila E.
The film's soundtrack includes Idol's "Cradle of Love", the video for which was shown often on MTV in 1990. The song also appeared on Idol's 1990 album Charmed Life. In the video, a young woman, played by Betsy Lynn George, taunts an uptight neighbor with her advances as she dances to the music. The video also featured footage from the film playing on a television in the neighbor's home, although none of the footage features Clay (at least not his face). This may be due to the infamous ban of Clay from appearing on the music network. Alternate versions of the "Cradle of Love" video eliminates the film footage when the video is usually aired on MTV. Richie Sambora's contribution to the soundtrack was a cover of the Jimi Hendrix song. Yello's "Unbelievable" samples bits of dialogue from the film, with one notable dialog switch - where in the film, a phone number is said as "1-800-Unbelivable" and in the song, the phone number is said as "1-800-Perfect". A number of the musicians featured on the soundtrack also appeared in the film itself, including Morris Day, Sheila E., Tone Loc (as Slam the Rapper), former Ozzy Osbourne bassist Phil Soussan, and drummer Randy Castillo appear playing the Black Plague concert during the flashback at the beginning of the film and Vince Neil, the lead singer of Mötley Crüe (who appeared as Bobby Black, the lead singer of the fictitious band, Black Plague). Black Plague's lead guitarist was played by Quiet Riot's axeman Carlos Cavazzo. Not appearing on the soundtrack is "Booty Time", the song that Ed O'Neill's character performs during the film. Yello is also credited with the film's "music score", and an early cut of their album Baby is used as the film's incidental soundtrack. The film's score was composed and conducted by Cliff Eidelman. Billy Idol's recording of "Cradle of Love" was named one of the "Most Performed Songs from Motion Pictures" by the ASCAP. The film received generally negative reviews upon release. Review aggregator website Rotten Tomatoes gives the film a 29% rating based on 28 reviews. On Metacritic, the film has a 24 out of 100 rating based on 13 critics, indicating "generally unfavorable reviews". Critic Roger Ebert gave the film 1 star out of a possible 4, and called the film "loud, ugly and mean-spirited" but he also suggested that Clay had the confidence and screen presence for a successful acting career if he could move beyond his shtick. The film was not a financial success during its original theatrical release, making just over $21 million in the U.S. Clay has claimed in interviews that the film had a successful first week before being pulled from theaters under pressure from the politically correct. In fact, the film played on more screens during its second week than its first, but still suffered a 53.5% drop in box office gross. The film "won" numerous Razzies at the 1990 Golden Raspberry Awards including Worst Actor (Andrew Dice Clay), Worst Picture (Joel Silver & Steve Perry — tied with Ghosts Can't Do It), and Worst Screenplay (Daniel Waters, James Cappe and David Arnott). It was also nominated for Worst Director and twice for Worst Supporting Actor (for both Gilbert Gottfried and Wayne Newton). Despite negative reviews in the US, the film enjoyed tremendous success in post-communist Hungary, where copies of a pirated, dubbed version were widely circulated in the burgeoning VHS market. The film's popularity in Hungary has been attributed to a high-quality dub starring iconic eccentric musician and actor Feró Nagy, which contains gratuitous use of profanity not found in the original English version of the film. Several lines of dialogue from the film became ingrained in the slang of Hungarian urban youth culture throughout the 90s. In Norway, after its 1992 VHS release, Ford Fairlane soon became a phenomenon. The catchphrases became hugely popular and the movie received cult status during the 90s. After huge demand from Norwegian audiences, the film was released on DVD in the early 2000s. It also became quite popular in Spain, especially due to the dub by the popular singer, actor and comedian Pablo Carbonell. ^ "THE ADVENTURES OF FORD FAIRLANE (18)". British Board of Film Classification. September 17, 1990. Retrieved July 24, 2015. ^ a b "The Adventures of Ford Fairlane (Summary)". Box Office Mojo. Retrieved 2013-06-06. ^ Weiner, Rex; Schwartz, Andy; Levin, Jay; Mutrux, Floyd (2018-07-17). The (Original) Adventures of Ford Fairlane: The Long Lost Rock n’ Roll Detective Stories (Original ed.). S.l. : Rare Bird Books, A Vireo Book. ISBN 9781945572807. ^ "The Adventures of Ford Fairlane". Rotten Tomatoes. Flixster. Retrieved 2013-06-06. ^ "The Adventures of Ford Fairlane". Metacritic. CBS Interactive. Retrieved July 24, 2015. ^ Ebert, Roger (July 11, 1990). "The Adventures of Ford Fairlane Movie Review (1990) | Roger Ebert". Rogerebert.suntimes.com. Retrieved 2013-06-06. ^ Harris, Will (2007-03-26). "Andrew Dice Clay Interview. Dice: Undisputed Interview". Bullz-eye.com. Retrieved 2013-06-06. ^ "The Adventures of Ford Fairlane (Weekend)". Box Office Mojo. Retrieved August 9, 2013.